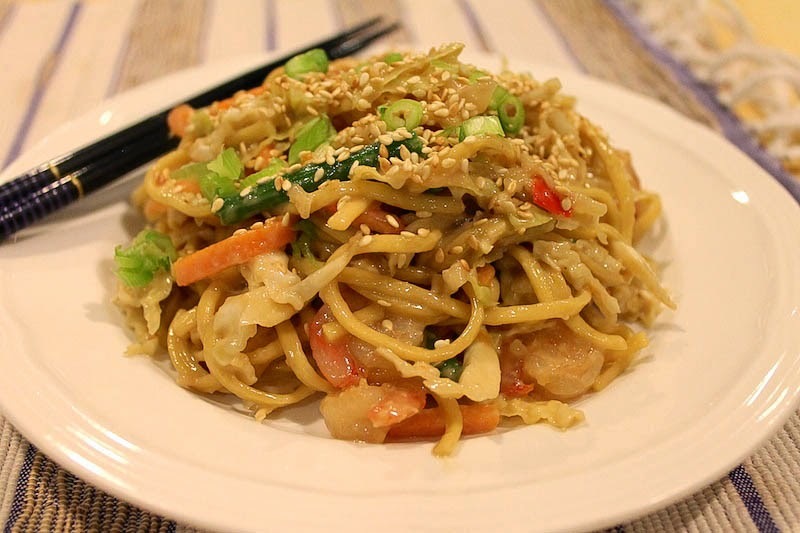 Chinese egg noodles with shrimp and crispy vegetables make a tasty, nutritious meal when tossed with savory peanut sauce. I grew up eating peanut butter and jelly sandwiches. And peanut butter cookies. You know, the homemade ones that have a crisscross made with a floured fork. I remember vividly the first commercials on television where choosy mothers chose Jif and friendly collisions got peanut butter in someone’s chocolate. And chocolate in someone’s peanut butter. But it took a trip to Indonesia when I was 18 years old to introduce me to a new use, a new savory love of peanut butter: Satay dipping sauce. Succulent bits of chicken or beef, marinated in special spices and grilled over an open charcoal flame by the dusty roadside, were meant to be dipped in a savory, spicy peanut sauce but I would just spoon that stuff over, full coverage being the fundamental goal. However delicious the satay, it was still primarily a conduit for the peanut sauce. Ever since, I have been on the lookout for other peanut sauce conveyances, in addition to the handy spoon. I first found this wonderful noodle dish a couple of years ago on one of my favorite blogs, Magnolia Days – you might remember me mentioning it recently when I was making sticky cinnamon figs for a guest post in that genteel space. Renee had adapted a recipe from the Mom 100 Cookbook and created a main course from a side dish. Or maybe salad. Doesn’t matter. What’s important is that the whole fabulous mess was coated in a savory, spicy peanut sauce. I don’t think I ever told Renee that I had made it then, or any time since, which is very remiss and ungrateful of me. Because it is good. And I am grateful. 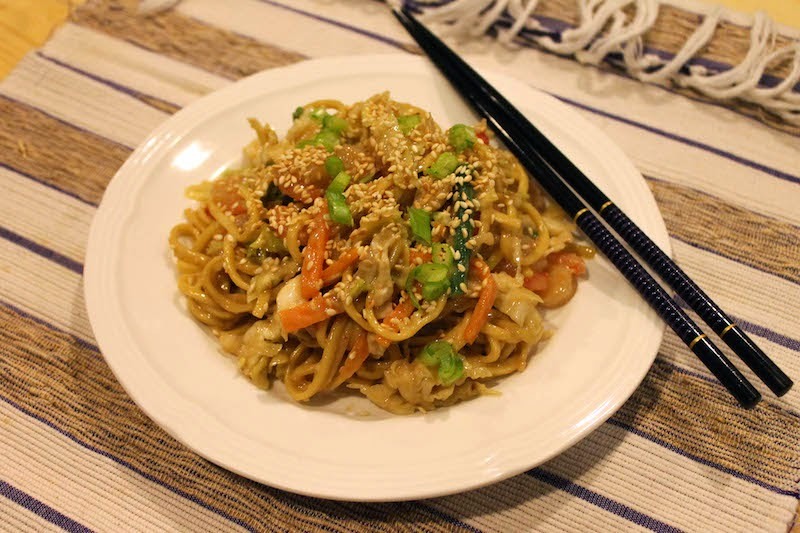 This month’s Foodie Extravaganza theme is peanut butter so I figured it was time to share these delicious noodles. 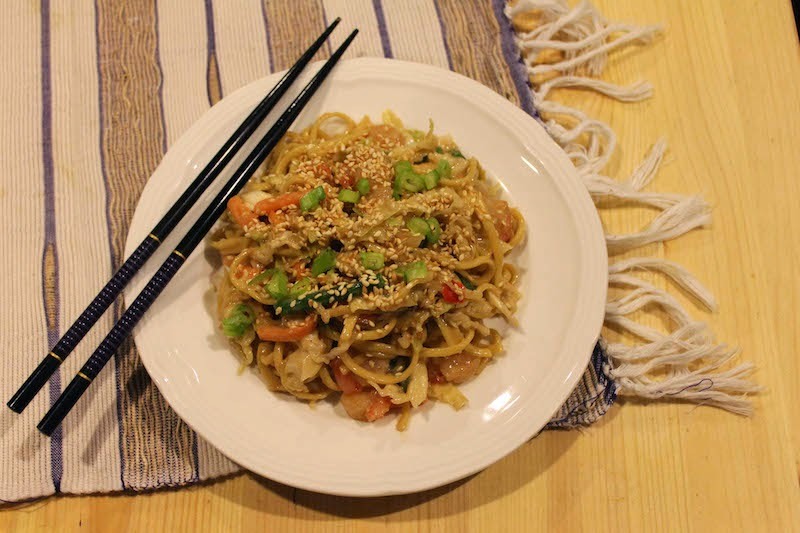 Over the last couple of years, I’ve made adaptations of my own, adding other vegetables that I have on hand, like bean sprouts, or substituting chicken for the shrimp. I like to put fresh red chilies and crunchy peanut butter in the sauce. 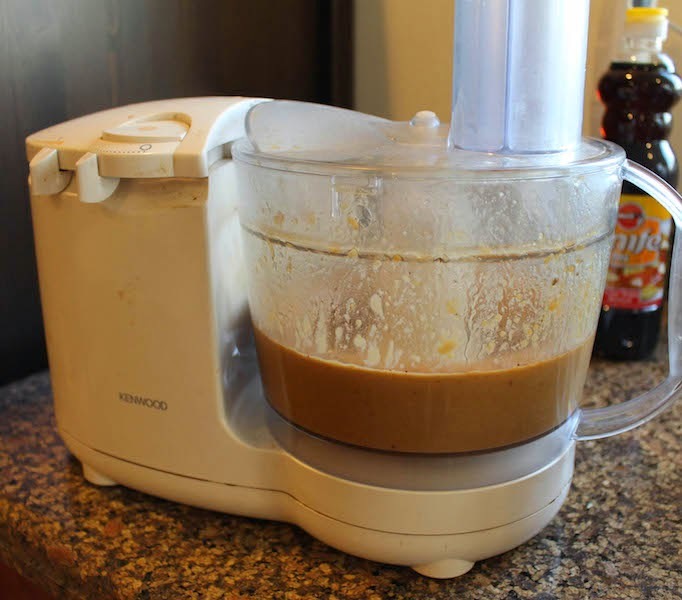 This is a great dish for mixing things up and using what you have, as long as you keep the peanut butter in the mix. Because that’s my favorite part. I hope it will be yours too. Many thanks to Kaylin from Keep It Simple, Sweetie, our Foodie Extravaganza host this month. To see more delicious Foodie Extravaganza treats or learn how to join the party each month visit us here. And make sure to scroll down to the bottom to see all 19 of the sweet and savory peanut butter dishes we have for you this month! Peel the carrot and cut it into sticks. Top and tail the green beans. Slice the cabbage finely as you would for coleslaw. Do the same with the onions. Put a large pot of lightly salted water on to boil. Peel the ginger and garlic. Chop the ginger into small pieces and cut the stems off of the chilies. 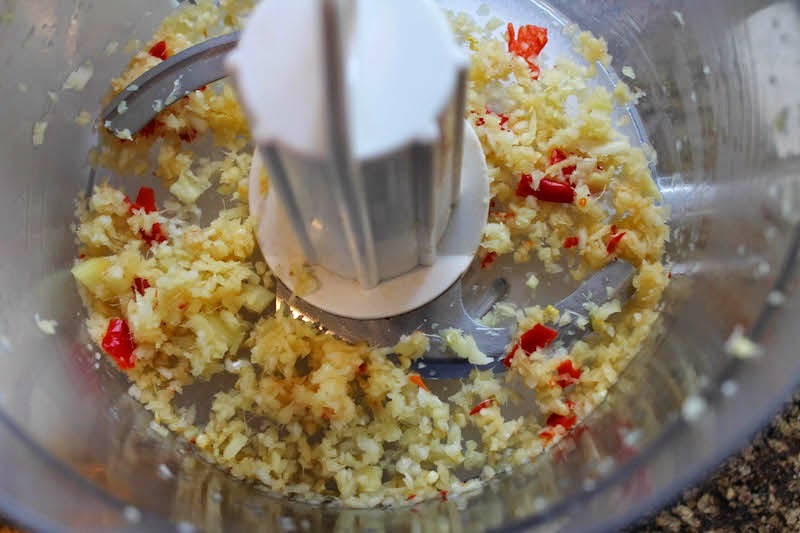 Put the ginger, garlic and chilies in the food processor and process for a quick minute. Add in the rest of the sauce ingredients and process until they are well mixed. Leave them in the food processor and get on with the rest of the dish. Add cold water and ice cubes to a medium-sized mixing bowl and set it in readiness next to your stove. 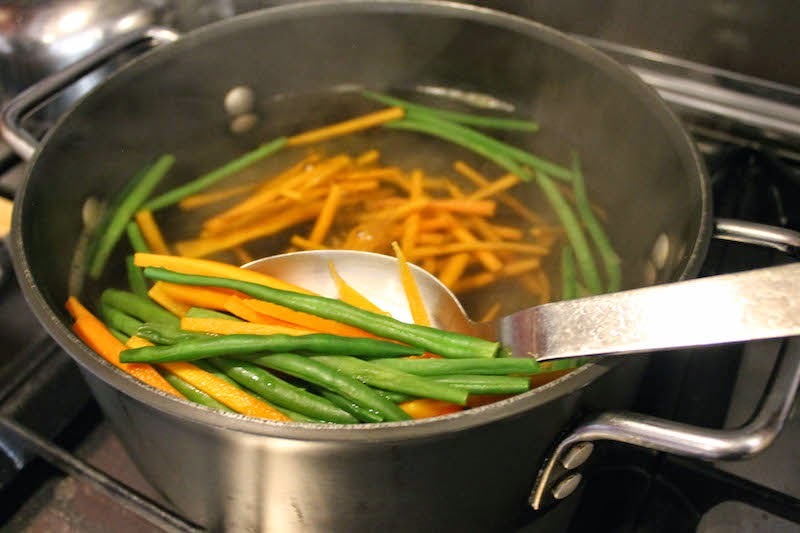 When the pot of water is boiling, put the carrots and green beans in for just a couple of minutes. Scoop them out with a slotted spoon and put them into the bowl of ice water. Add the noodles into the pot of boiling water and cook as per packet instructions. Some take longer than others so following the manufacturer’s recommended time, perhaps minus a minute or two, is your best bet. 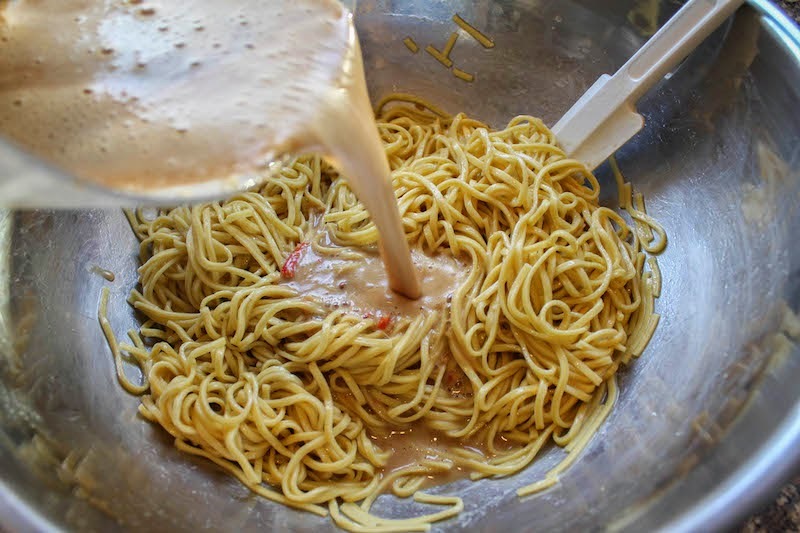 When the noodles are almost cooked, scoop out 1/4 cup or 60ml of the noodle water and add it to the sauce in the food processor. Process to combine. 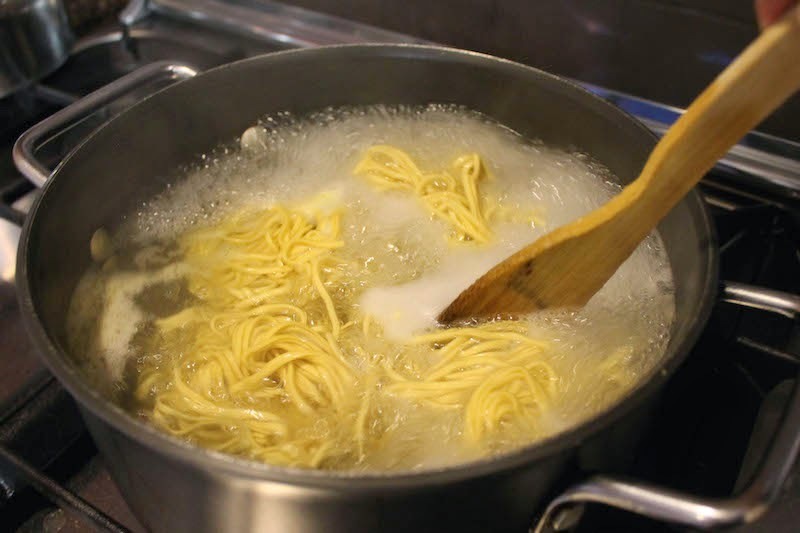 Pour the cooked noodles into a colander and rinse them with very hot water. 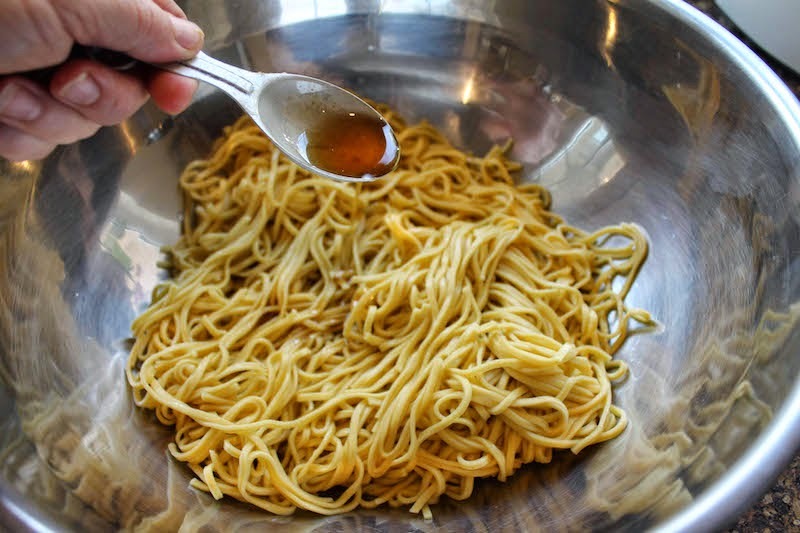 Put the noodles in a large mixing bowl and toss them with 1 1/2 tablespoons of sesame oil. 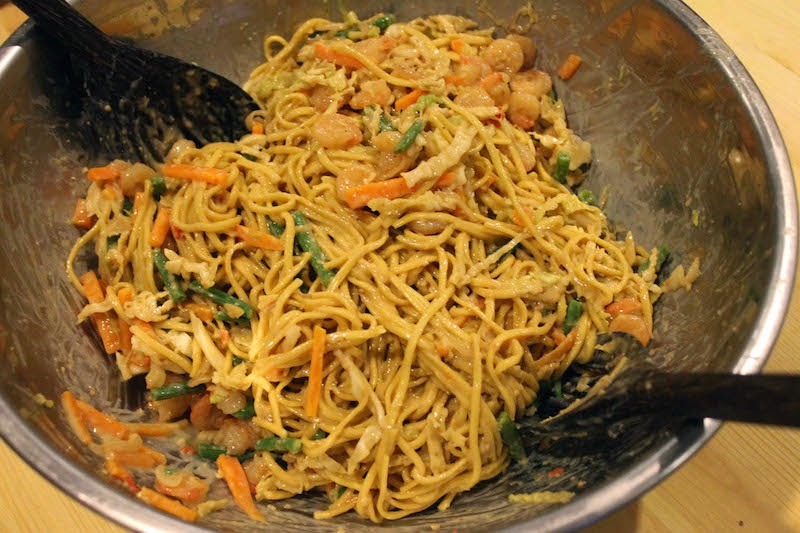 Now pour the peanut sauce in the food processor over them and toss again to make sure the noodles are well coated. In the now empty noodle pot, sauté the sliced onions in one tablespoon of peanut oil. Add in the sliced cabbage and cook briefly. You want it wilted a little but still crunchy. 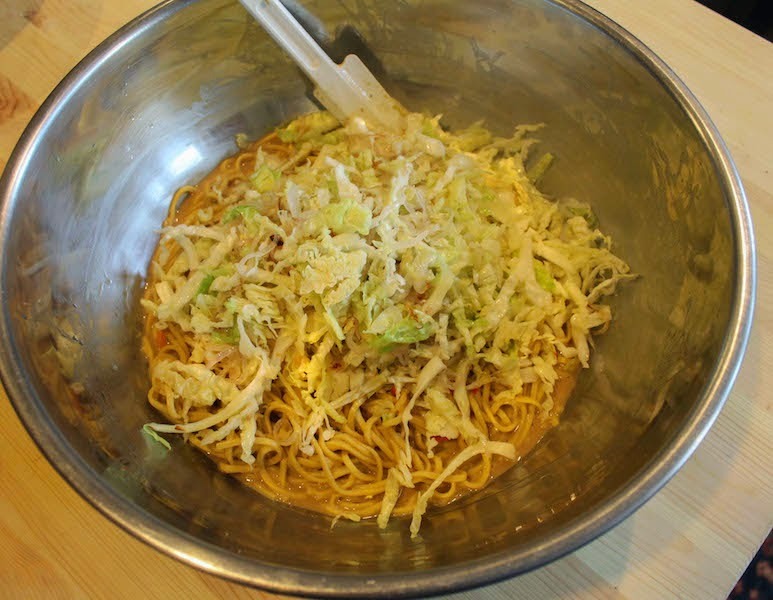 Add the onions and cabbage to the noodles and stir well. Cover the bowl and allow it to hang out for 30 to 45 minutes so the noodles can absorb the flavors of the sauce. 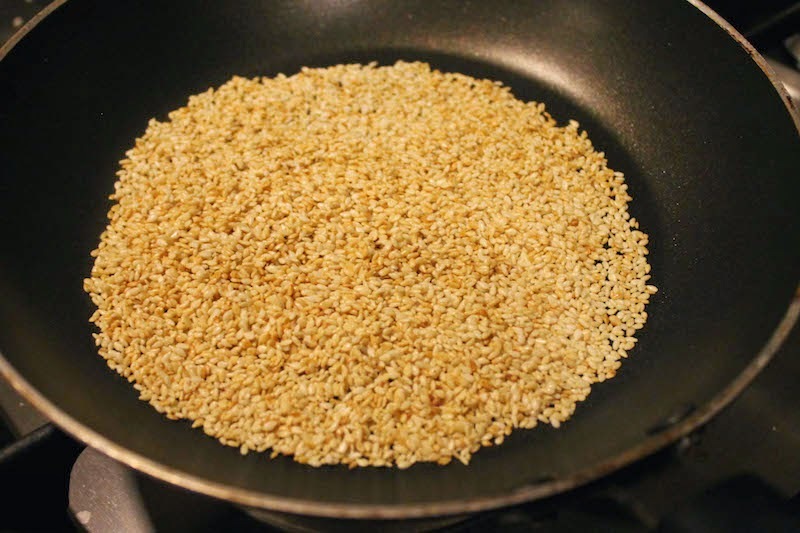 While you are waiting for the noodles, you can lightly toast your sesame seeds in a small non-stick skillet on the stove and chop some green onions for garnish, if desired. 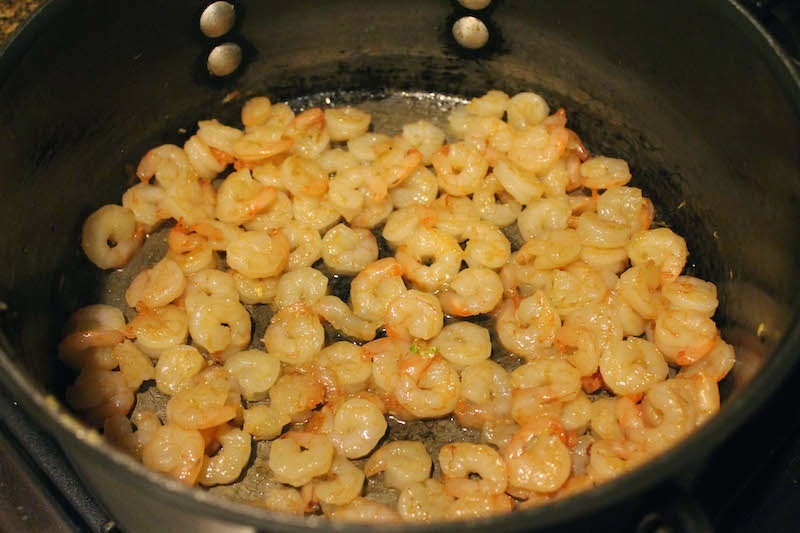 When the noodle sitting time is almost up, once again, use your same pot to cook the shrimp with a little peanut oil and a light sprinkle of salt, just until they turn pink. Drain the carrots and green beans and cut them into bite-sized pieces with your kitchen scissors. Add them to the noodles along with the shrimp. Toss well to mix. 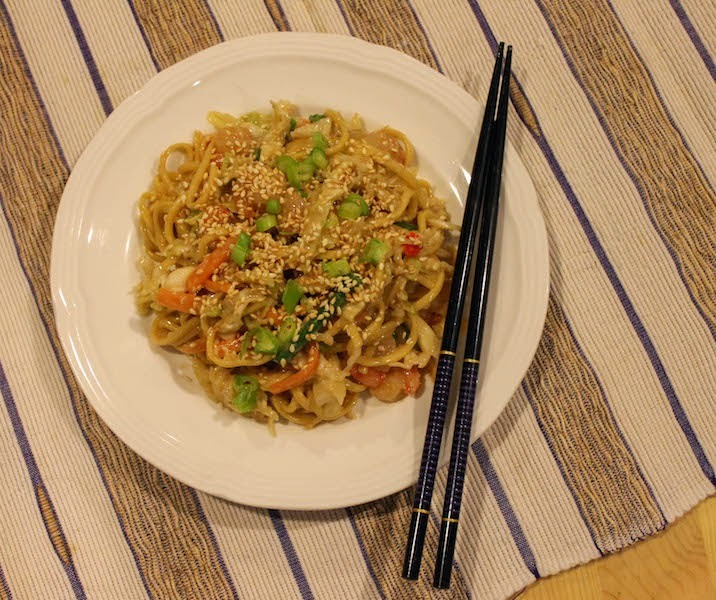 Serve with a generous sprinkle of the toasted sesame seeds and some chopped green onions, if desired. This dish is supposed be served at room temperature but it is also quite tasty cold which makes it great lunchbox fare. If this is your first time joining us, the Foodie Extravaganza is a monthly party hosted by bloggers who love food! Each month we incorporate one main ingredient or theme into recipes to share with you and this month that ingredient is a classic American family favorite...PEANUT BUTTER!